Before our son was born I admit I was pretty clueless about babies. It was only at our John Lewis nursery appointment that I learned about not using baby wipes for the first couple of weeks. So we stocked up on cotton wool and I religiously washed his face, fingers and toes with cotton wool and boiled water until he was 6 months old. Our little boy has had eczema since birth so we’ve always been careful what products we use on his face and body. I knew that most wipes contained preservatives or chemical additives so have always used them sparingly. A new baby wipe has recently been launched in the UK called DermaH20 WaterWipes. 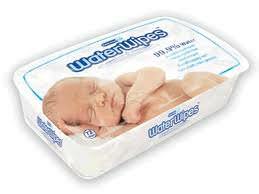 They contain none of the preservatives or chemical additives that all other baby wipes contain. They’re made from just 99.9% water, 0.1% grapefruit seed extract, and nothing else. They offer all the benefits of cotton wool and cooled boiled water, as recommended by midwives, without any of the hassle. We were sent a sample to review and they are lovely to use for wiping grubby faces and hands, changing nappies and generally wiping surfaces and highchairs when you’re out and about. I love the idea behind these and that they contain no chemicals. I would recommend them for everyday use.